It is the core technology of Ghost Core Platform and refers to the code that combines and encrypts the colors of light. 고스트 코어 플랫폼(Ghost Core Platform)의 핵심 기술로 빛의 색상을 조합하고 암호화시킨 코드를 뜻합니다. Encrypted color code values are created in infinite random forms instead of with fixed values and have an organic structure. It creates infinite random numbers as if it were alive and that random number value is only used once for strict security purposes. Therefore, when hacking and illegal intrusion are detected, it disturbs them by continually exposing infinite numbers of falsely encrypted random number values and it also possesses an aggressive security as it can infiltrate the hacking program and disable it. This is the source blocking system for any attempts to hack Ghost Chain Container Technology. It is a complete security system which was packaged level by level from the developing phase and made through multi faceted process. It was developed to be used by general public on a device like a cellphone with the encryption code simply created with a drawn pattern on the device by the user on his or her own. 암호화된 컬러코드 값은 고정값이 아닌 무한 랜덤 형태로 만들어지며 매우 유기적인 구조를 가지고 있습니다. 마치 살아있는 것처럼 끝없이 무한한 난수값을 만듭니다. 그리고 그 난수값은 철저한 보안 목적으로 일회성으로만 사용됩니다. 때문에 해킹 및 불법침입이 감지 될 때, 거짓된 무한대의 암호화 난수 값을 끝없이 노출시켜서 교란시키고, 해킹 프로그램에 침투하여 무력화 시키는 공격적인 보안성도 가지고 있습니다. 이것이 고스트체인 컨테이너 테크놀로지의 해킹에 대한 원천 차단 시스템이며, 개발 기술 단계에서부터 레벨별로 패키징하여 다원화 된 공정을 거쳐 만든 완벽한 보안 시스템입니다. 이를 디바이스(모바일 등의 기기)의 터치패널을 물리적인 자율 패턴의 암호화 코드와 함께 연동시켜 일반인 누구나 손 쉽게 사용할 수 있도록 개발되었습니다. Color Code based on the core technology of this Ghost Chain Security System will create a new ecosystem that integrates with the 4th industrial revolution. With this compensation system, many users will be given fair labor and reasonable rewards, and this will be soon shared under the name of 'Mining Color Code' in connection with the mining ideology of the blockchain. 이러한 고스트 체인 보안 시스템의 핵심 기술에 기반한 컬러코드는 4차 산업혁명에 걸맞는 새로운 형태의 생태계를 조성하게 될 것입니다. 이 보상 시스템을 통해 많은 유저들은 정당한 노동과 그에 따른 합리적 보상을 받게 될 것이며, 이것은 곧 블록체인의 채굴 이념과 맞닿아 "마이닝 컬러코드" 라는 이름으로 그 가치를 공유하게 됩니다. The past marketing methods that judged the success of marketing just with the numbers in revenue are not proper these days. This is because we've come to a point where we can measure consumer behavior patterns that are connected from digital marketing to performance, and also predict customer buying behavior online. The method the Mining Color Code presents will offer alternative to the interaction between the company and the customer. In addition, it will bring a huge impact on the current advertising market, and a new advertising ecosystem will be created through the maximized compensation system. 단순히 매출의 숫자만으로 마케팅의 성패를 판단해 왔던 과거의 마케팅 방식은 이제 맞지 않습니다. 현재는 디지털 마케팅에서 퍼포먼스까지 연결되는 소비심리 행동패턴을 측정하고, 온라인상에서 고객의 구매 성향을 예측하기에 이르렀기 때문입니다. 앞으로 마케팅은 광고와 기술이 접목된 애드테크와 맞물려 더 복잡해지고 세분화 될 것입니다. 기업들도 더 다양한 분석을 통해 고객과의 상호작용을 위한 노력을 기울이고 있습니다. 마이닝 컬러코드가 제시하는 방식은 기업과 고객의 상호작용에 또 다른 대안을 제시할 것입니다. 더불어 기존 광고시장의 큰 파급효과를 가져올 것이며, 극대화 된 보상 시스템을 통해 새로운 광고 생태계가 만들어 질 것입니다. Through that activity, energy (time, electric power, data usage, etc.) will be consumed, and that will be reasonably compensated. New compensation system, Mining & Ad-Tech, is very easy and accessible. 개인이 가지고 있는 디바이스(스마트폰 등) 안에서 유저들은 광고를 시청 합니다. 그 행위를 통해 에너지(시간, 전력, 통신비 등)가 소비되고 거기에 합당한 보상을 받게됩니다. 곧 Mining & Ad-Tech라는 새로운 보상 시스템은 매우 쉽고 간편하기 때문에 접근성이 매우 뛰어납니다. 마이닝 컬러코드는 가상화폐 채굴에 광고 영역의 컨텐츠 채굴의 실물 가치를 부여하는 하이브리드 마이닝 시스템으로 설계되었습니다. 작동 방식은 컬러코드를 슬라이드하여 마이닝을 진행시킨 후 광고를 시청하면 되며, 정해진 시간(자동모드 180초, 멀티모드 30초)내에 반복적으로 슬라이드하여 채굴을 진행합니다. 충전된 가스를 모두 소진할 때까지 광고를 시청할 수 있으며, 채굴된 포인트 일부로 다시 가스를 구매하고 충전하여 마이닝을 지속할 수 있습니다. 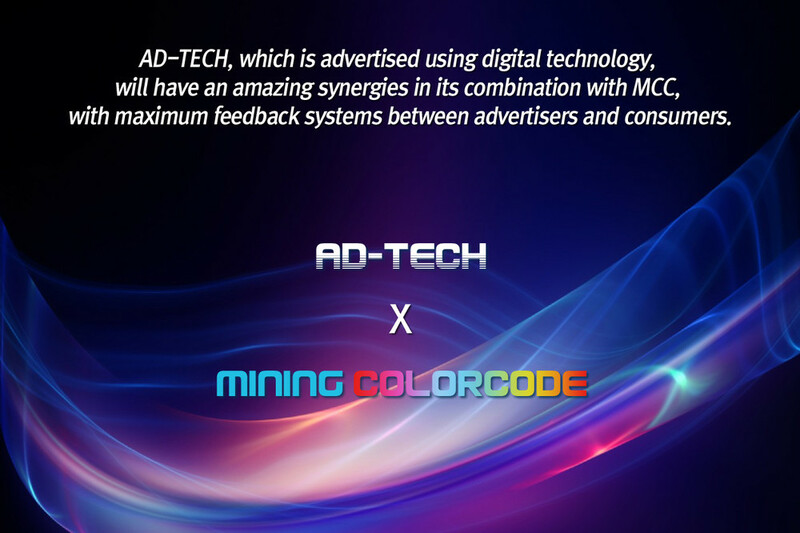 Mining Color Code is designed as a hybrid mining system where the real value is given to content mining in the advertisement field of cryptocurrency mining. The commercial can be viewed until the gas runs out and the mining can be continued after the gas is bought and recharged with the points that were mined. 마스터회원(유료로 전환한 회원)만이 무료 사용자를 추천하여 가입시킬 수 있으며, 팔로워(무료 회원)들이 채굴한 포인트 일부를 수수료로 획득할 수 있습니다. 팔로워들이 증가함으로써 보상받는 마이닝 포인트는 늘려갈 수 있지만, 그에 합당한 책임과 관리의 의무가 있습니다. 무료 회원 역시 유료회원으로 전환이 가능하며, 팔로워 추천 기능을 통해 채굴 금액을 확대할 수 있습니다. 마스터회원을 통해 가입한 팔로워가 유료 회원으로 전환할 경우, 해당 신규 마스터 그룹에서 나오는 총 채굴의 일정 부분을 회사에서 인센티브로 받게 됩니다. Mining points will accrue as the number of followers increase but proper management and responsibility is required. Free members can also convert to paying members and the mining amount can be maximized through the follower recommendation function. In case which a follower registered through a master member converts to a paying member, the master group will receive part of the mining achieved from that specific group as an incentive from the company. 채굴을 통해 획득한 보상의 단위는 MCCT로 표기됩니다. 적립된 MCCT는 자신의 고스트월렛으로 보내서 MCCX나 다른 암화화폐로 교환이 가능합니다. 고스트월렛은 일회성 컬러 보안코드가 적용된 안전한 암호화폐 지갑이며, 크립토뱅크 시스템과 핀테크 시스템이 결합된 차세대 금융 플랫폼입니다. 고스트월렛에서 MCCT를 MCCX로 교환하거나 BTC, ETH로 교환하여 거래소에서 현금으로 교환할 수도 있습니다. The unit of compensation achieved through the mining will be identified as MCCT. Accrued amount of MCCT can be sent to the individual's ghost wallet and exchanged with MCCX or different cryptocurrency. Ghost wallet is a safe cryptocurrency wallet with the application of one-time color security code and it's a next generation financial platform with the combination of crypto bank system and FinTech system. MCCT can be exchanged with MCCX, BTC, or ETH in ghost wallet and that can be exchanged with cash at a transaction center subsequently. - 회사에서는 오직 BTC로만 유료회원으로 전환하며 현금은 절대 받지 않습니다. - 유료회원 전환 취소 및 해지는 하기 사유를 포함하여 불가능합니다. 신중히 고려하여 마스터 전환 신청을 해주시기 바랍니다. - System purchase fee is is non-refundable. 저희 MCC는 회원님들과 원활한 소통을 위해 본사 교육팀에서 운영하는 네이버 카페로 모든 문의 접수를 이관합니다. 아래 버튼 링크로 연결되는 카페에 들어가셔서 팔로워 질문접수 게시판 또는 마스터 질문접수 게시판에 궁금하신 문의를 요청해주시기를 부탁드립니다. 모든 문의에 대한 답변은 1~2일 소요가 됩니다. 기본적인 질문이나 자주하는 질문들은 아래 버튼으로 이동하여 해당페이지를 이용해주시기 바랍니다.